This document is on one 8 1/2" x 13" sheet of paper. It's a yellowish off-white. It is a nice quality 20# bond with a watermark of BERKSHIRE / SOUVENIR BOND / U.S.A. The sheet is in good condition. It has three horizontal fold lines; it was folded into quarters when I received it, and I've flattened it. Everything on it is typed; it has no handwriting. There are several typos, only some of which were corrected. 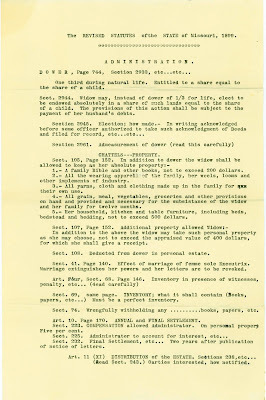 The page starts out at the top with "The Revised Statutes of the State of Missouri, 1899", which conveniently are available online. The version I found first was published in 1899 in Jefferson City, Missouri by Tribune Printing Company, "State Printers and Binders." I don't think this version is exactly the same as the one quoted from here, as the very first item listed — Dower, Section 2933 — is said to be on page 744, while the edition I found shows Section 2933 on page 745. So it's close, but not exact. The next section quoted, 2944, regarding the widow's option to take a child's share, is on page 747. Section 2945, "Election; how made", is on page 748. Section 2961, "Admeasurement of dower", is on page 751. This is a very short section, so it's interesting that there's a comment to "read this carefully." Under "Chattels—Property", Section 105 actually is on page 152 in the edition I found. The items listed on the page also appear in the online version, but wheels was incorrectly typed as "weels" here. Section 107, "Additional property allowed Widow", is still on page 152, as is Section 108, "Deducted from dower." Section 41, "Effect of marriage of femme sole Executrix", does appear on page 140. Surprisingly, even though Article Four, Section 68 appears on page 146, in the version I found this section doesn't say anything about taking inventory in the presence of witnesses. Rather, it instructs that the administrator needs to take the estate under his control. That's a significant difference. The next section quoted, 69 — Inventory; what it shall contain — is on the same page and matches what's in the digitized book. Section 74, on page 147, does include language about wrongfully withholding anything back from the inventory. Article 10, "Annual and Final Settlement", appears on page 170, as quoted here. Section 223, "Compensation allowed Administrator", and Section 225, "Administrator to account for interest", are on page 172. Section 232, "Final Settlement", is on page 173. Article 11, "Distribution of the Estate", begins on page 175, with the first section being 238. Section 243, "[P]arties interested, how notified", which has a notation to read it, is on page 176. Overall, the book I found online seems to match almost exactly the one used as a source for this reference sheet. I'm confused about how different Section 68 is. If the book used was actually the Revised Statutes of the State of Missouri, 1899, one would think they should be the same, even if it were a later printing. Overall, the sections quoted here focus primarily on the widow's rights, inventory, and final settlement. It's possible that this was compiled to use as ammunition for the court case that Jean and Emma La Forêt had considered filing against Emma's siblings regarding the disposition of their mother's estate. 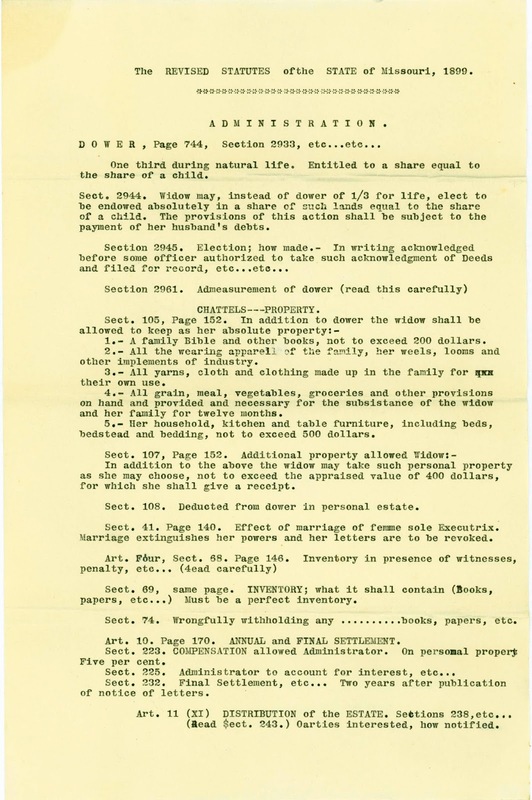 I don't know how much this would have helped, however, because the provisions for the widow's share might have been superceded when Elizabeth (Walz) Schafer remarried, with all of her property at that time coming under the control of her second husband, Louid Curdt. In fact, one of the quoted sections, 41, specifically addresses this. The inventory sections would seem to be more relevant to the situation the La Forêts found themselves in after Elizabeth's death. I think the most surprising thing about this sheet is that it has no handwritten notes, nothing to identify its purpose among the other documents. I've gotten used to seeing those, and they've helped guide me in understanding several of the items. Without those hints, I can't really tell where this fits in. I don't even really know who typed it.